Too Big To Fail - What Does It Mean? What does "too big to fail" mean? What is the definition of "too big to fail"? During the financial collapse in the second half of 2008, the term "too big to fail" became a part of the mainstream consciousness. In capitalism, some companies succeed while others fail. That's just the way it is - capitalism is survival of the fittest. However, some companies are deemed to be "too big to fail". A company that is "too big to fail" will be saved by the government, either directly (through a bailout) or indirectly (via the guarantee of certain loans, etc. if a private company will step up and take over the company). A company that is "too big to fail" is deemed to be too important to fail. 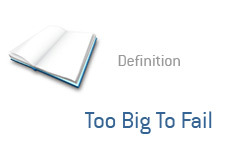 If a company is deemed to be "too big to fail", that means that the company is too important to the economy to go under. If they did go under, then the results would be catastrophic for the entire economy. A company that is "too big to fail" is thought to be too interconnected to let fail. Meaning: their failure would likely trigger the failure of numerous other companies. An example of a company that is "too big to fail" - AIG. The failure of AIG during the darkest days of the financial meltdown would have resulted in the imminent demise of numerous other companies (or at least, that's what we have been led to believe), meaning that the government had no other recourse but to step in and bail out AIG. A company that is "too big to fail" has the implicit backing of the federal government. There is almost no chance that a company like Goldman Sachs would ever be allowed to fail.